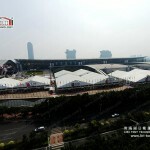 Zhuhai Liri Tent Technology Co., Ltd. has been established for 18 years, which is mainly engaged in design, manufacture, sales and rental of high- quality aluminum clear span structure tent systems. After the trials and hardships for almost 20 years, Liri Tent became the biggest company in Chinese tent industry till 2014 with total assets of 120 million Yuan and nearly 500 employees. Established in 1997, with its self-developed aluminum-PVC tent structure systems and right of self-run export, Liri Tent has exported tents throughout the world including developed countries and areas. 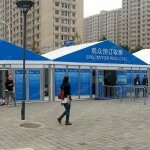 In 2002, the self-developed big tent series from Liri Tent were first showed in Canton Fair. 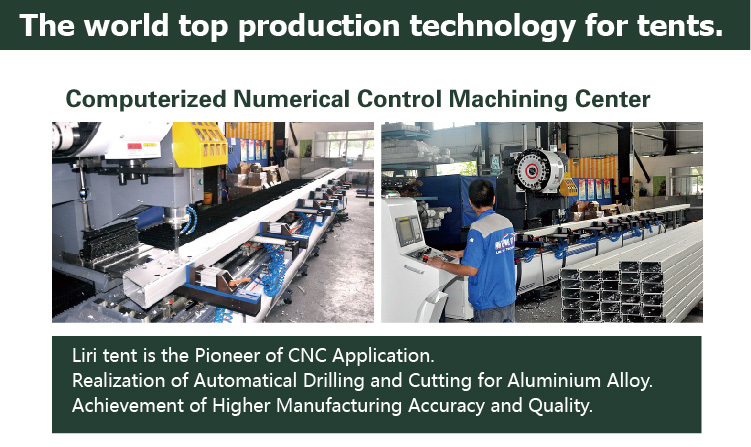 With its advanced technology of designing and manufacturing, the domestic and overseas sales performance improved rapidly, which ensured the company’s rapid and stable development, technology improvement and bigger production scale. In 2006, 20 million Yuan was invested to purchase an industrial land of 30,000m2 and build a factory covering 18,000m2 in Xinqing Science & Technology Industrial Park, Doumen, Zhuhai, Guangdong, China. 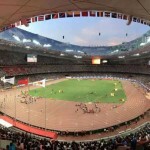 Ten years later, Beijing and Guangzhou Branches were established in 2012. 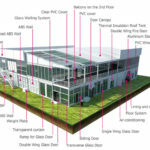 To satisfy the growing production demands, in 2014 Liri Tent purchased 70,000m2 industrial land for expansion, and planned to complete the construction of 27,000m2 new factory buildings in two years. 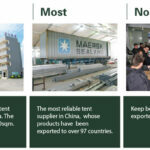 Since then, Liri Tent will be the largest tent manufacturer in the world with 100,000m2 factory area. As the pioneer in the tent industry, Liri Tent always keeps advancing with the times and leadership of the tent industry. It has passed the accreditation of ISO 9001:2000 International Quality Management Systems in 2006. Base on pursuing the satisfaction of customers and aiming at innovation, Liri Tent introduced advanced ERP system in 2008 to form an integrated management system of material resources, human resources, financial resources and information resources, therefore, efficiencies from production to sales has been increased greatly. 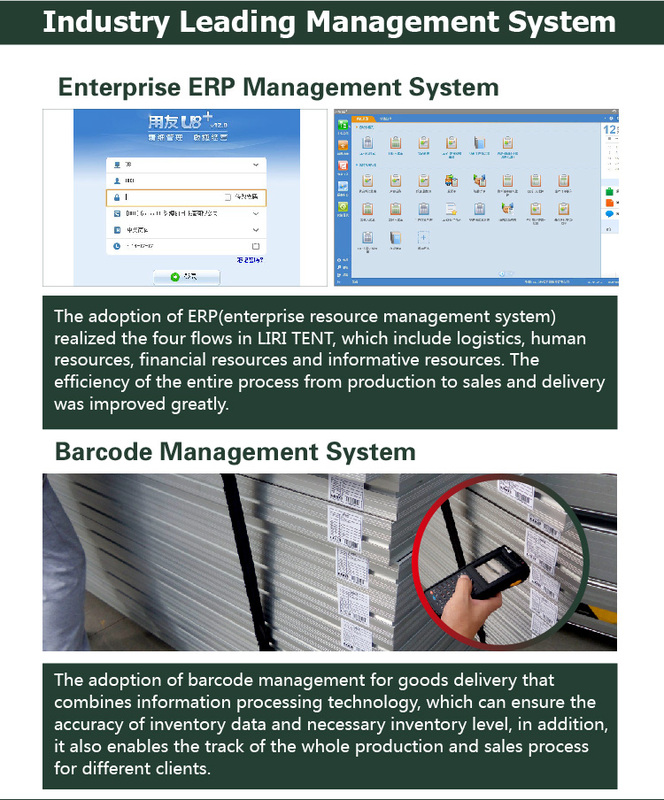 In 2013, to manage every piece of goods more effectively and scientifically, Liri Tent introduced bar code management system. With this system, combining the barcode technology and information processing technology, Liri Tent ensures the accuracy and rationality of inventory, and customers can track whole process from production to sale. With superior production techniques, Liri Tent also became the pioneer to apply CNC machines, achieving the automatic drilling of tent aluminum structures and automatic cutting of PVC fabrics, which ensures higher accuracy and quality of manufacturing. Furthermore, Liri Tent is the unique factory in China who imported automatic washing machine from Germany, achieving automatic washing for PVC fabrics. The applications of those advanced equipments reduce the labor intensity and improve production efficiency. Liri tents are modular structures which adopt hard pressed extruded aluminum and PVC fabrics, with span width range from 3m to 80m. In appearance, there are multiple designs and shapes, such as A shapes, high peak conversions, dome shapes, curved shape, polygon and so on. Liri engineering team is professional and innovative, and masters core technologies in tent industry and has obtained over 10 utility model patents, and become one of high-technology enterprise supported by nation in Zhuhai, Guangdong province, which is under examination and approved. With this professional and innovative engineering team, Liri Tent has gradually developed curve tent series, dome tent series, multi-sides tent series, polygon tent series, cube structure tent series and double decker series and so on. The 18-years is bound to be a milestone for Liri Tent, during which we have achieved great success; 2015, a new starting point for Liri Tent, but we have already seen hopes not far away. “Day and night double my life; however high, I will fly”, so bold, so ambitious, every Liri people has no reason not to believe that there will be numerous 18-years awaiting us ahead.